DIE Sabbati, 22 die Decembris. Houses burnt in London Judicature Bill. L. Colepeper, Leave to be absent. D. Bucks released upon his Petition. Marq. Dorchester relea'ed upon his Petition. Orders to prevent new Provocations between them. Prosser, her Servant, to be released. Committees to meet during the Recess. Prosser released before the Order was served. Heads for a Conference thereon. Epus. Rochester. E'wardus Comes Clarendon, Ds. Cancellarius Angliæ. Johannes Ds. Robertus, Custos Privati Sigilli. Robertus Comes Lyndsey, Ds. Magnus Camerarius Angl. Edwardus Comes Manchester, Ds. Camerarius Hospitii. Hodie 1a vice lecta est Billa, "An Act for making Provisions for such Places and Persons as shall be infected with the Plague." Hodie 1a vice lecta est Billa, "An Act for erecting a Judicature for Determination of Differences touching Houses burned or demolished by reason of the late Fire which happened in London." 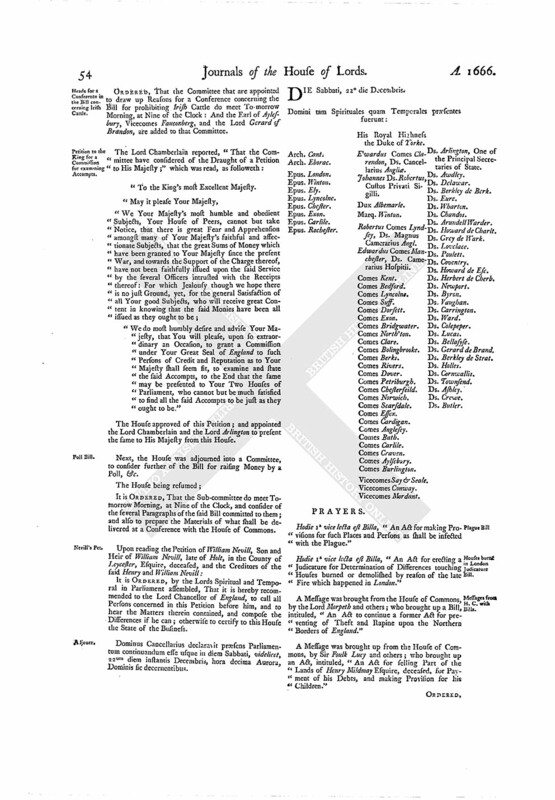 A Message was brought from the House of Commons, by the Lord Morpeth and others; who brought up a Bill, intituled, "An Act to continue a former Act for preventing of Theft and Rapine upon the Northern Borders of England." 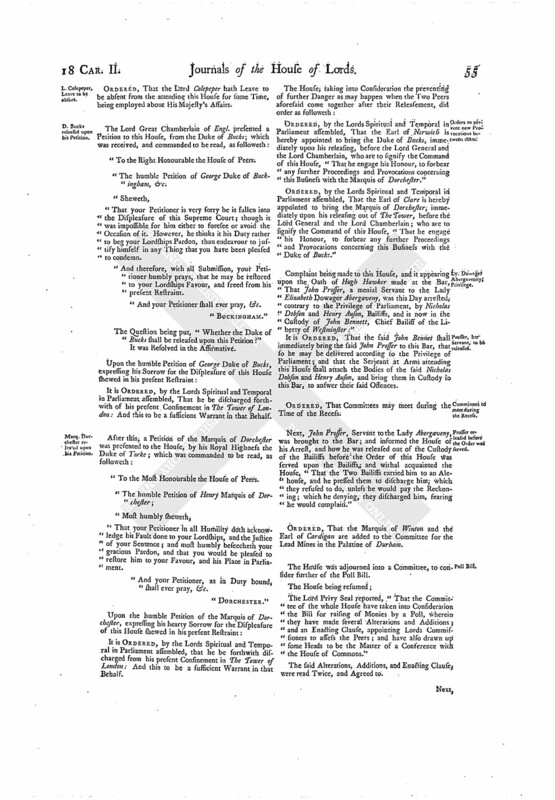 A Message was brought up from the House of Commons, by Sir Foulk Lucy and others; who brought up an Act, intituled, "An Act for selling Part of the Lands of Henry Mildmay Esquire, deceased, for Payment of his Debts, and making Provision for his Children." ORDERED, That the Lord Colepeper hath Leave to be absent from the attending this House for some Time, being employed about His Majesty's Affairs. "To the Right Honourable the House of Peers. "The humble Petition of George Duke of Buckingham, &c.
"That your Petitioner is very sorry he is fallen into the Displeasure of this Supreme Court; though it was impossible for him either to foresee or avoid the Occasion of it. However, he thinks it his Duty rather to beg your Lordships Pardon, than endeavour to justify himself in any Thing that you have been pleased to condemn. "And therefore, with all Submission, your Petitioner humbly prays, that he may be restored to your Lordships Favour, and freed from his present Restraint. The Question being put, "Whether the Duke of Bucks shall be released upon this Petition?" It is ORDERED, by the Lords Spiritual and Temporal in Parliament assembled, That he be discharged forthwith of his present Confinement in The Tower of London: And this to be a sufficient Warrant in that Behalf. "To the Most Honourable the House of Peers. "That your Petitioner in all Humility doth acknowledge his Fault done to your Lordships, and the Justice of your Sentence; and most humbly beseecheth your gracious Pardon, and that you would be pleased to restore him to your Favour, and his Place in Parliament. "And your Petitioner, as in Duty bound, shall ever pray, &c.
It is ORDERED, by the Lords Spiritual and Temporal in Parliament assembled, that he be forthwith discharged from his present Consinement in The Tower of London: And this to be a sufficient Warrant in that Behalf. 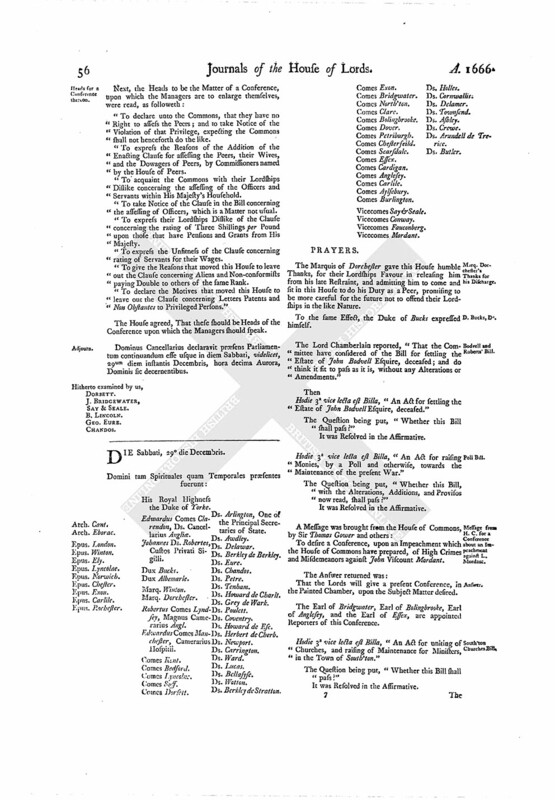 ORDERED, by the Lords Spiritual and Temporal in Parliament assembled, That the Earl of Norwich is hereby appointed to bring the Duke of Bucks, immediately upon his releasing, before the Lord General and the Lord Chamberlain, who are to signify the Command of this House, "That he engage his Honour, to forbear any further Proceedings and Provocations concerning this Business with the Marquis of Dorchester." ORDERED, by the Lords Spiritual and Temporal in Parliament assembled, That the Earl of Clare is hereby appointed to bring the Marquis of Dorchester, immediately upon his releasing out of The Tower, before the Lord General and the Lord Chamberlain; who are to signify the Command of this House, "That he engage his Honour, to forbear any further Proceedings and Provocations concerning this Business with the Duke of Bucks." Complaint being made to this House, and it appearing upon the Oath of Hugh Hawker made at the Bar, That John Prosser, a menial Servant to the Lady Elizabeth Dowager Abergaveny, was this Day arrested, contrary to the Privilege of Parliament, by Nicholas Dobson and Henry Auson, Bailiffs, and is now in the Custody of John Bennett, Chief Bailiff of the Liberty of Westminster:"
It is ORDERED, That the said John Bennet shall immediately bring the said John Prosser to this Bar, that so he may be delivered according to the Privilege of Parliament; and that the Serjeant at Arms attending this House shall attach the Bodies of the said Nicholas Dobson and Henry Auson, and bring them in Custody to this Bar, to answer their said Offences. ORDERED, That Committees may meet during the Time of the Recess. Next, John Prosser, Servant to the Lady Abergaveny, was brought to the Bar; and informed the House of his Arrest, and how he was released out of the Custody of the Bailiffs before the Order of this House was served upon the Bailiffs; and withal acquainted the House, "That the Two Bailiffs carried him to an Alehouse, and he pressed them to discharge him, which they refused to do, unless he would pay the Reckoning; which he denying, they discharged him, fearing he would complain." ORDERED, That the Marquis of Winton and the Earl of Cardigan are added to the Committee for the Lead Mines in the Palatine of Durham. The House was adjourned into a Committee, to consider further of the Poll Bill. The Lord Privy Seal reported, "That the Committee of the whole House have taken into Consideration the Bill for raising of Monies by a Poll, wherein they have made several Alterations and Additions; and an Enacting Clause, appointing Lords Commissioners to assess the Peers; and have also drawn up some Heads to be the Matter of a Conference with the House of Commons." The said Alterations, Additions, and Enacting Clause, were read Twice, and Agreed to. "To declare unto the Commons, that they have no Right to assess the Peers; and to take Notice of the Violation of that Privilege, expecting the Commons shall not henceforth do the like. "To express the Reasons of the Addition of the Enacting Clause for assessing the Peers, their Wives, and the Dowagers of Peers, by Commissioners named by the House of Peers. "To acquaint the Commons with their Lordships Dislike concerning the assessing of the Officers and Servants within His Majesty's Household. "To take Notice of the Clause in the Bill concerning the assessing of Officers, which is a Matter not usual. "To express their Lordships Dislike of the Clause concerning the rating of Three Shillings per Pound upon those that have Pensions and Grants from His Majesty. "To express the Unfitness of the Clause concerning rating of Servants for their Wages. "To give the Reasons that moved this House to leave out the Clause concerning Aliens and Non-conformists paying Double to others of the same Rank. "To declare the Motives that moved this House to leave out the Clause concerning Letters Patents and Non Obstantes to Privileged Persons." The House agreed, That these should be Heads of the Conference upon which the Managers should speak. Dominus Cancellarius declaravit præsens Parliamentum continuandum esse usque in diem Sabbati, videlicet, 29um diem instantis Decembris, hora decima Aurora, Dominis sic decernentibus.